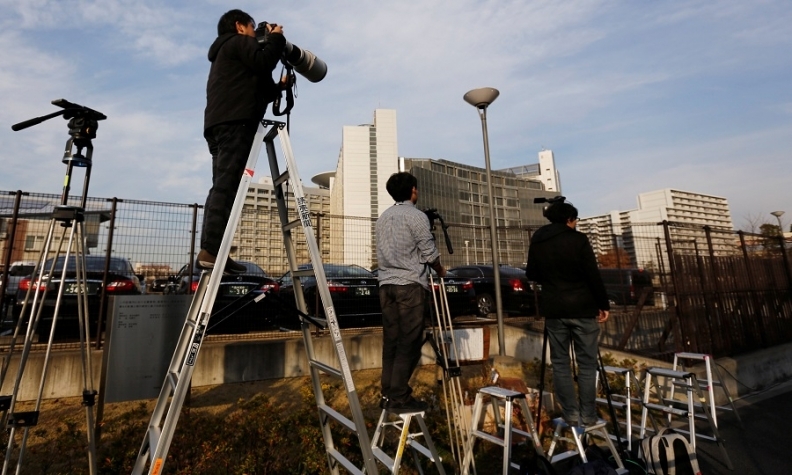 Media members crowd in front of Tokyo Detention Center, where Ghosn is being held. TOKYO -- Carlos Ghosn’s hopes of getting out of jail were bolstered after a Japanese court refused a bid by prosecutors to extend his detention. They were then dashed on Friday when prosecutors arrested him again on new allegations of making Nissan shoulder $16.6 million in personal investment losses, dashing chances he would be released on bail before Christmas. The Tokyo District Court on Thursday dismissed an appeal by Japanese prosecutors to prolong the 64-year-old former Nissan chairman’s imprisonment, clearing the way for lawyers to seek his release on bail. The re-arrest, however, means he could be detained for at least another 10 days in a Tokyo jail, where he has been confined since he was arrested last month on initial allegations of financial misconduct. Ghosn wants to give a media conference if he makes bail and hopes the court will allow him to travel out of Japan, before returning for the trial -- where he intends to plead not guilty, lawyer Motonari Otsuru told Bloomberg News. The arrest of the high-flying executive has rocked the world’s biggest auto alliance, raising questions over whether the decades-long partnership between Nissan and Renault will survive his downfall. Ghosn was indicted on Dec. 10 for understating his income from Nissan by 4.8 billion yen ($43 million) in the five years to March 2015. He was also re-arrested for understating compensation for a three-year period up to March this year. Since Ghosn’s arrest at a Tokyo airport, prosecutors have repeatedly extended his detention. On Thursday, the court also rejected an appeal to extend the detention of Ghosn aide Greg Kelly, who was arrested at the same time over his alleged role in helping the executive understate his pay. Nissan, which dismissed Ghosn as chairman after accusing him of the pay violations and of using company money for personal use, declined to comment. Ghosn has been widely credited with saving Nissan from failure and bringing it together with Renault to create a formidable auto union. His arrest came after a months-long investigation by Nissan into his conduct and compensation that was largely kept from its French partner. That lack of transparency and concern Nissan will use Ghosn’s absence to push for more power within the alliance has heightened tensions between the two automakers. If proven, Ghosn’s alleged offense may carry a sentence of as much as 10 years, prosecutors have said. He remains at the helm of Renault, which has demanded more information on his misdeeds from its alliance partner. Nissan has also accused Ghosn of misusing company funds, including over homes from Brazil to Lebanon. Nissan and Kelly were indicted along with Ghosn on the misreported pay allegations. Under the Japanese system, an indictment allows prosecutors to lay formal charges. Much of the case seems to revolve around Ghosn deferring pay from Nissan until his retirement, compensation that was allegedly not reported by the carmaker. Ghosn’s lawyers have said the charge is flawed because the compensation agreement wasn’t properly ratified, according to a statement from the office of Otsuru, Ghosn’s lawyer. Otsuru is a former head of a special investigation task force of the Tokyo public prosecutor’s office. Nissan’s board removed Ghosn from the post of chairman on Nov. 22 and ejected American citizen Kelly from his position as a representative director. Renault, which is the biggest shareholder in Nissan, has refrained from removing Ghosn from the post of CEO, instead appointing an interim person to the role. Ghosn was the mastermind behind the game-changing alliance and his arrest has seen disagreements between Nissan and Renault bubble to the surface. Renault’s most powerful shareholder, the French state, says Ghosn is presumed innocent until proven guilty and has demanded Nissan share the evidence it’s collated against him. Nissan CEO Hiroto Saikawa traveled to Amsterdam for a Dec. 18 meeting of the alliance between Nissan, Renault and the third partner, Mitsubishi Motors Corp. While there, he had a one-on-one meeting with Renault interim chief Thierry Bollore that Saikawa described as “positive” and “productive,” according to Nissan. Saikawa has emerged as a driving force in the investigation about the alleged wrongdoing by Ghosn and Kelly. Renault, Nissan’s largest shareholder and the company that bailed out the Japanese automaker two decades ago, has been pressing for specifics, as has the French government.